•	Saturday, Sept. 29, 10AM to 4PM. •	Saturday, Oct. 6, 10AM to 4PM. •	Saturday and Sunday, Nov. 10 and 11, 10AM to 4PM. •	Saturday, Nov. 17 10AM to 4PM. 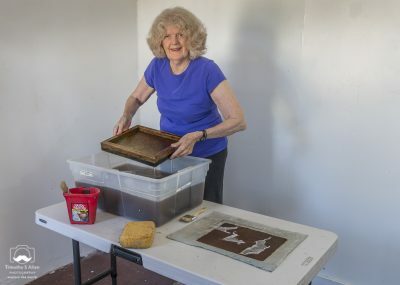 Papermaking Studio Rental: Jane’s Papermaking Studio is available for your personal rental (weekdays or weekends) at a fee of $15/hour (minimum of 4 hours). To rent the studio you are required to take at least one workshop with Jane and attend a special session with Jane about using the studio. Jane will prepare materials and be there for consulting. You will have use of the studio space and Jane’s equipment. Materials cost will depend on what pulp and other materials from Jane are used and will be discussed at the studio session.